It’s hard to change habits of teenagers and young adults. To really change the perception of classical music and the orchestra we had to go deeper. We had to plant the seed among children. Children don’t have established habits and tastes. Everything is new and that’s the exact moment that is possible to insert classical music in their culture. Based on the fact that famous cartoons are orchestrated, we recorded the orchestra playing complete episodes from several cartoons, everything from the soundtracks to the sound effects.In partnership with one of the largest children’s TV channels in Brazil, we launched a free tablet app. Before the cartoon starts, children just needed to point the tablet to the TV to synchronize and listen to the orchestra playing throughout the entire episode. 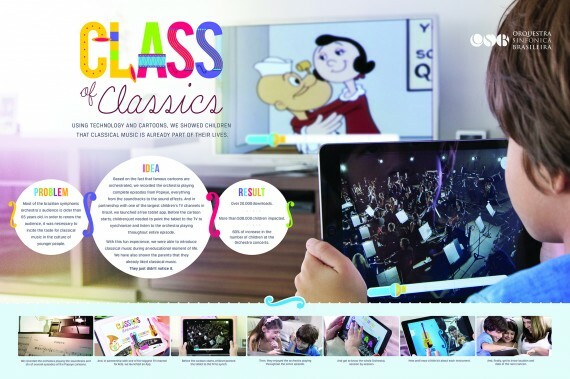 With this fun multiple media experience using 2 screens (TV + tablet), technology and, of course, the power of cartoons as our foundation, we were able to introduce classical music during an educational moment of the dhildren’s lives.